With hundreds of amazing restaurants throughout San Diego county, it can be hard to pick which one to try when lunch or dinner rolls around. This September, the California Restaurant Association San Diego County wants to help make that decision a little easier with a week of delicious prix-fixe lunches and dinners at many of San Diego’s award winning restaurants. More than 180 San Diego restaurants will invite diners to indulge in three-courses prepared special for this occasion only at discounted prices with prix-fixe lunches priced at $10, $15, and $20 and three-course prix-fixe dinners are $20, $30, or $40. No tickets necessary for this event, just make reservations for any of the participating locations, show up, choose from their prix-fixe menu and let your taste buds enjoy! #SDRWTaste2013 is an exclusive first look at what San Diego Restaurant Week September has to offer with over 40 of San Diego Restaurant Week’s best restaurants will be serving up samples of house specialties that will delight your taste buds! Each food sample will be paired with a unique beverage to enhance the flavors of each dish you sample. 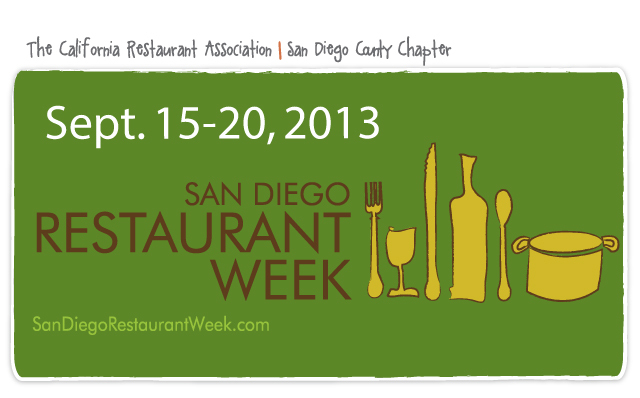 Which restaurant are you excited to try during this September’s San Diego Restaurant Week? This entry was posted in Culinary, San Diego Events and tagged dinner, discount, lunch, san diego restaurant week by Brent Bernasconi. Bookmark the permalink. Great! This is something to look forward to. I would love to try different foods from different restaurants. Can you make a post of your top 5 best restaurant so I can try them first when I go there?